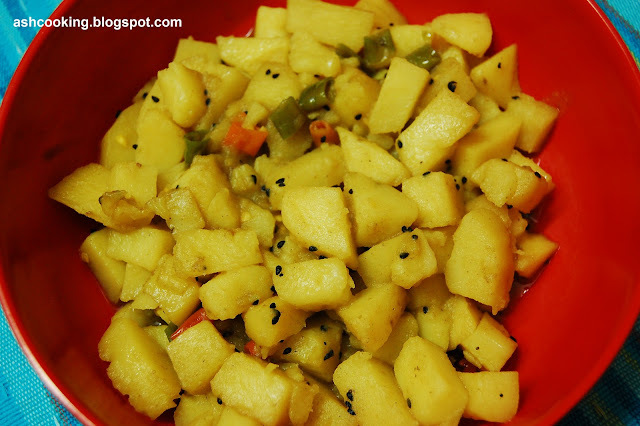 This is a very typical Bengali potato curry staple in almost all Bengali households. With a dash of minimum ingredients, this potato curry exudes an exquisite flavour that combined with luchi, puri or karashuti kachuri makes a fulfilling meal. You might have read my post on karaishuti kauchri, if so; you might have noticed the curry featured along with it. 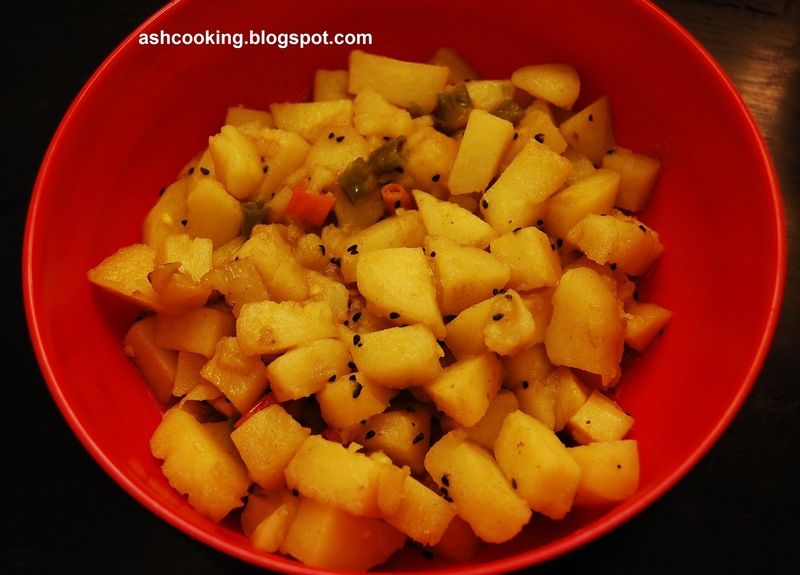 Yes, this is the tastiest yet simplest of all potato curries I have ever eaten. Needless to mention, one of my favourite. Note: If the potato belongs to the breed of Chandramukhi abundantly found in Kolkata and very soft in texture, then you may cook it directly while preparing the curry or else if the potato belongs to an unknown breed and takes time as much as lentils to soften, then please boil it in either microwave or in pressure cooker. It will reduce the cooking time. 1) Heat oil in a pan. When the oil turns hot, add nigella seeds and wait for it to crackle. 2) Then slide in the potato cubes and shallow fry, stirring intermittently. 3) Toss green chillies, turmeric powder, salt and sugar and mix in properly. Add 1/2 cup of water and bring the curry to a boil. Cook covered. 4) When the potatoes turn soft with mild gravy bubbling round them, turn the heat off. Oh don't you forget to check the seasoning. 5) Serve hot with luchi, puri, kachuris, parathas and even chapatis. Enjoy.